QLE2560 Host Bus Adapter. 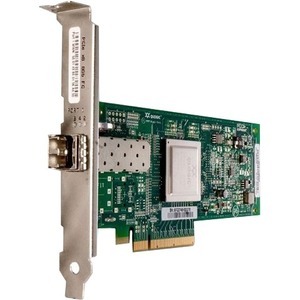 The QLE2560 is a PCI Express, single port, Fibre Channel (FC) Host Bus Adapter (HBA). The QLE2560 is part of the QLE2500 HBA product family that offers next generation 8Gb FC technology, meeting the business requirements of the enterprise data center. RAS Optimized. The QLE2560 provides the highest data integrity by ensuring Overlapping Protection Domains (OPD) on both the control and data paths. Management Optimized. The QLE2560 is backward compatible with 4Gb and 2Gb speeds. A single common driver per operating system for three generations of FC HBAs (8Gb, 4Gb, and 2Gb) simplifies deployment. QLogic's unified driver model (firmware embedded in the driver) eliminates potential interoperability issues between firmware and driver versions. The QLE2560's API compatibility with 4Gb products accelerates deployment while ensuring application compatibility.